Kate Stelmanis' opening performance was the perfect compliment to Tegan and Sara. Her trio consisting of guitarist Carmen Elle , percussionist - xylophonist Maya Postepski, and Kate who utilized a MAC laptop and a NORD Keyboard. Kate's voice and her vibrato were powerful and intriguing. I would describe her music as more modal than just minor with rhythms that have a sort of marching quality. Strangely enough Kate's music reminded me of the late 70's British band Renaissance. Stelmanis performed nine very interesting songs that seemed to win over the more than respectful audience. There was an irony in opening up for Tegan and Sara because Kate said that at 17 she gave them her demo but she was sure they hadn't listened to it. Kate Stelmanis admitted that she was still happy to have the opportunity to be opening for Tegan and Sara. She stated that she was a longtime fan. Kate Stelmanis definitely has a beautiful voice with it's own character and resonance. I can't say that her songs completely won me over but I did see talent in Friday night's performance and hope to hear more from her in the future. I know the dynamic between sisters fairly well. I grew up with 2 older sisters who were close in age to each other. I was commonly regarded as their baby brother, and as most siblings, I got to bare witness to my sisters interactions on a daily basis. I guess it was a comfortable fit because not long after starting college, I became a close long time friend of twin sisters. Some sisters, like mine are inseparable. So, whatever happens, it is smart to never come between them. Sisters argue. Sisters complain about each other. But the thing they do best is rib each other. There is always one sister who ribs more than the other, still they both are guilty of doing it. I have even known one of my sisters to talk about the other sister to me as if that other sister weren't in the same room. The ribbing almost sounds as if it's a stand-up comedy routine. The reason I've started this posting talking about my sisters is because Tegan and Sara reminded me how cute and funny the dynamic between sisters can be. The show on Friday night was chock full of ribbing from Tegan and passive aggressive ribs back from Sara. The rapport Tegan and Sara had on stage was endearingly funny. Their banter, which was refreshingly unrehearsed, is something Tegan and Sara are known for. When I did a search on YouTube, I found many clips of Tegan and Sara with more banter than music. I even found a few clips of Friday night's show. Tegan and Sara's repartee with their audience is just as laughable as their rapport with each other. All through Friday night's show a predominantly female audience screamed things out. Tegan and Sara most often either responded or would have a small conversation. Early in the show, there was a female audience member who said she wanted a picture with Tegan and the band's set list. The woman said she wanted those things because she was from Pakistan. Tegan said “I'm from Canada, what do I get?” Tegan later answered her own question by saying "free health care." Not long after, Sara had a conversation with a woman in the front row. Sara asked the woman to watch out for people who might jump on stage. She asked the woman to basically give her a “heads up.” All of Tegan and Sara's asides never took away from the music. They were always taken as humorous departures from Tegan and Sara's serious and often sad lyrics. I have to admit, I was a little skeptical about seeing Tegan and Sara because in order to acquaint myself with their music, I needed to give their CDs several listens. However in concert their sound grabbed me immediately. I think it might have to do with their type of music being digitally recorded as opposed to analog. With that said, I think the material off the new CD “Sainthood” is wonderful. All the songs are worth a listen. The songs that are my favorites are “Hell,” “Northshore” and “Alligator.” On Friday night, Tegan and Sara seemed to be on a mission to completely play all the songs from their CD. I read in a review of the LA show that they are doing a mini-tour to promote their CD which clarifies the reason they wanted to do all the songs from their new CD. They also did the exact same set in New York as they did in LA. Most, if not all, of Tegan and Sara's material is under or around 3 minutes, which made a quick moving set of 24 songs and enough time for banter. They were backed by drummer Johnny Andrews, bassist Sean Hubberts and guitarist Ted Gowans. Tegan, Sara, Sean and Ted all had keyboards beside them and all switched to keyboards for various songs in the show. Aside from switching to keyboards, Tegan and Sara constantly had different guitars brought out to them depending on each song. Guitar switching happened a lot, not to the point of being annoying just to the point of being noticeable. 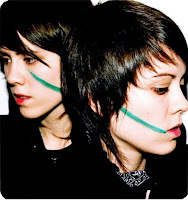 Conscience or not, Tegan and Sara follow the old adage “the only rule is that there are no rules.” The adage is reflected in the structure of their songs, in their musicianship and especially in their performance. For Example, they made it very clear after their 22nd song that they were not going to do the traditional encore thing. Sara basically stated that her and Tegan had played a long set as justification for not doing an encore. So she asked the audience to act as if they had just returned to the stage before doing the last two songs. When Sara was thanking the audience for coming out. She stated that more than buying their recordings, she appreciated when fans came out to see them live because essentially they are a live band. It was at that point I thought to myself, that none truer words had been spoken. I will definitely catch them next time around. Oh, by the way, Tegan gave the set list to the woman from Pakistan before leaving the stage.